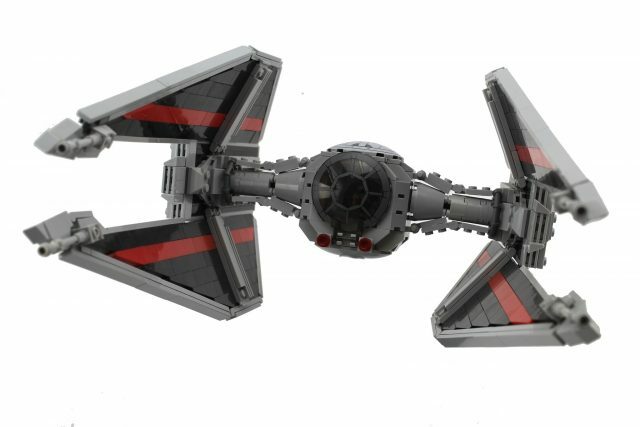 Star Wars has brought us so many cool and iconic LEGO spaceships over the years, but in my opinion, one of the coolest and most intimidating fighters in the Imperial fleet is the TIE Interceptor. From the angled wings to the four wing-mounted laser cannons, this is one fierce fighter. This model by sok117 depicts a specific Interceptor that, according to Legends, was the leader for Saber Squadron, an elite unit tasked with defending the Star Destroyer Avenger during the Battle of Endor. This model features a red stripe on each wing panel which sets it apart from other TIE Interceptors.